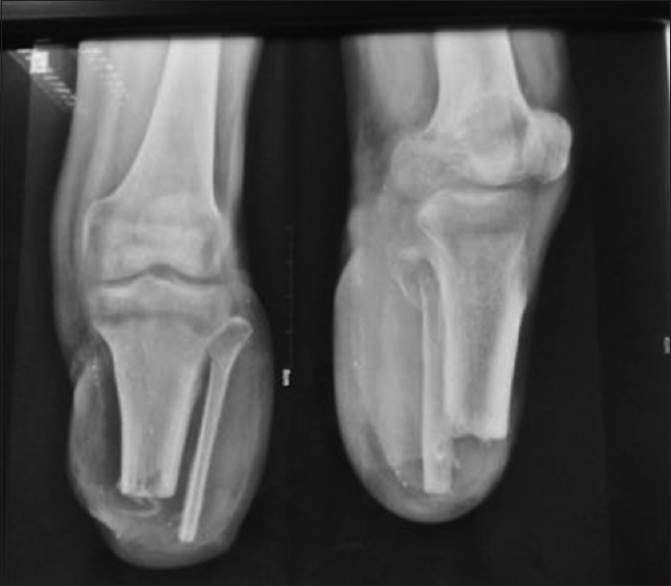 The aim of the present study was to assess the outcome of management of infected nonunion of tibia by Ilizarov technique. The objectives of the study were to eradicate infection and achieve bony union while maintaining length and alignment of the limb along with early mobilization. The results were analyzed radiologically skeletal and functional results using Association for the Study and Application of Methods of Ilizarov (ASAMI) scoring system. The study was carried out at All India Institute of Medical Sciences Raipur between May 2016 and December 2017. A total of 16 patients presented to our outpatient department diagnosed as infected nonunion tibia were included in this study. Necessary permission from Institutional Ethical Committee was taken. Patient with clinical and radiological evidence of nonnion of tibia with infection with or without draining sinus included. Patients with associated neurovascular injuries or any other conditions which would interfere with postoperative rehabilitation were excluded from the study. Out of 16 patients, 12 were male and 4 were female, 14 patients had age <40 years, two patient were between 40 and 60 years. Nearly 2 (15%) patients had infected nonunion of the upper third of tibia, 9 (60%) patients had middle third tibia involved, and 5 (25%) patients had lower third tibia involved. Out of 16 patients, 14 had a road traffic accident and two had a history of fall from height. Initially, all 16 patients had compound fracture tibia and were managed at other centers. Out of 16 patients, eight had external fixator, six had intramedullary nail, and two had plating done. All patients had clinic-radiological evidence of nonunion with signs of infection present. 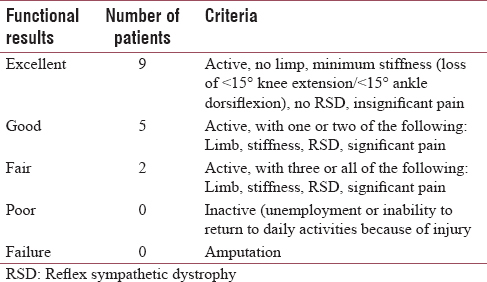 An average of 1.5 surgical interventions (range 1–3) was carried out in all cases before applying an IRF. The mean interval from the initial treatment to application of IRF was 24 weeks [Table 1]. All patients were operated under spinal anesthesia. 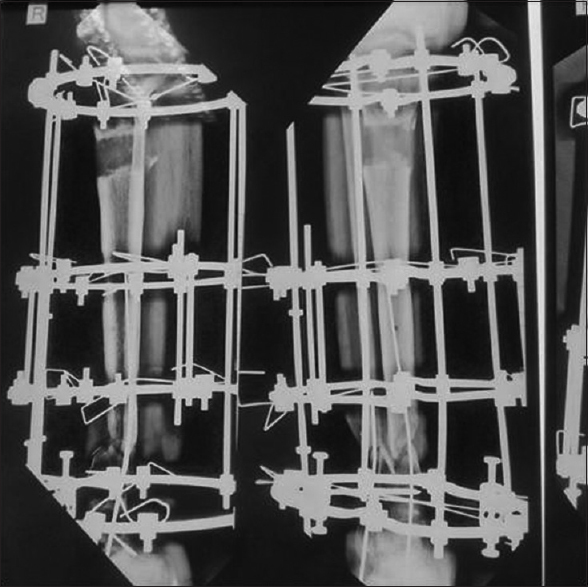 Depending on preoperative radiological and clinical findings, Ilizarov frame was constructed. The nonunion site was extensively debrided, and bone ends were freshened and any sequestrate bone or hardware removed. In cases with intramedullary nails, the canal was reamed and thoroughly lavaged after removing the nail. The defect created after freshening and debridement was assessed. If the defect was <2.5 cm (including prior bone loss), docking at fracture site done, If the defect is >2.5 cm, corticotomy at a suitable site was done. We usually used a 160 mm, 4/5 ring construct, however, modified it according to need. 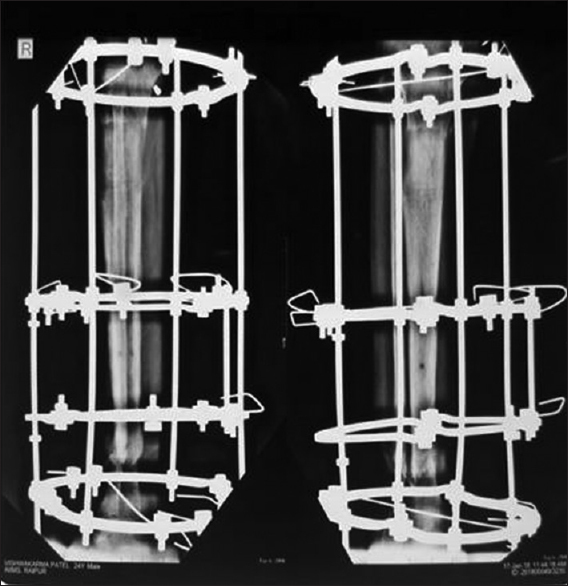 In lower third fractures of the tibia foot, plates were used to prevent equinus deformity. 1.8 mm Ilizarov wires were used. Fibulectomy was done whenever required. In cases where fibula was fractured in such a way that it would not interfere with tibial union, it was left alone. In the immediate postoperative period, the operated limb was elevated, and the distal neurovascular status checked. Antibiotics were used according to culture sensitivity report. 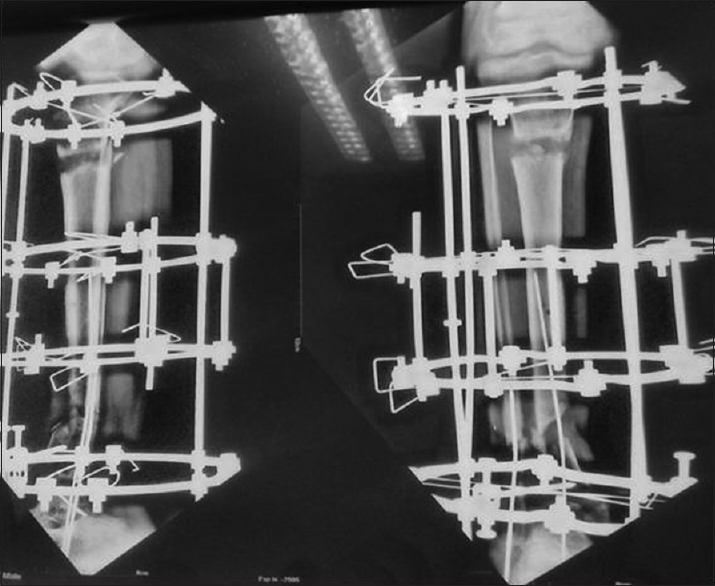 On the first postoperative day, frame stability and pin sites were checked. Frame stability was checked manually by ensuring that all nut bolts were tightly fitted, and wires were properly tensioned. Gentle Range of movement exercise of adjacent joint was started and patients were encouraged to bear weight on the 2nd postoperative day. Out of 16 patients, 10 had shortening of >2.5 cm; hence, coricotomy was done and six patients had shortening <2.5 cm; hence, docking at fracture site was done. In 10 patients, distraction of 1 mm per day was started usually on the 7th postoperative day (range 7–9 days). Moreover, in remaining six patients, alternate compression and distraction, Accordion maneuver started on 7th day, patients were discharged on the 10th to 15th postoperative day after teaching them distraction or Accordion manuver and pin site care. At follow-ups, frame stability, pin site condition, and range of motion of adjacent joints were checked and any complication noted and treated. Radiographs were taken at appropriate times to access union and/or quality of regenerate. 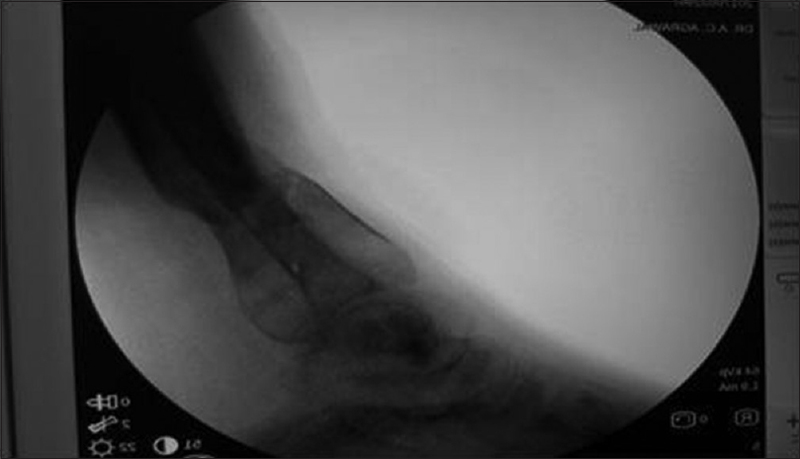 Loosening of frame, pin track infection, and poor quality of bone regenerate was the most common complication observed. For pin track infection, grading and management were done as per Dahl's grading. Grade VI – Inflamed with ring sequestrum. Grade V – Structural callus is seen. Evaluation of clinical follow-up results was done according to the protocol of ASAMI. All patients achieved bone union. 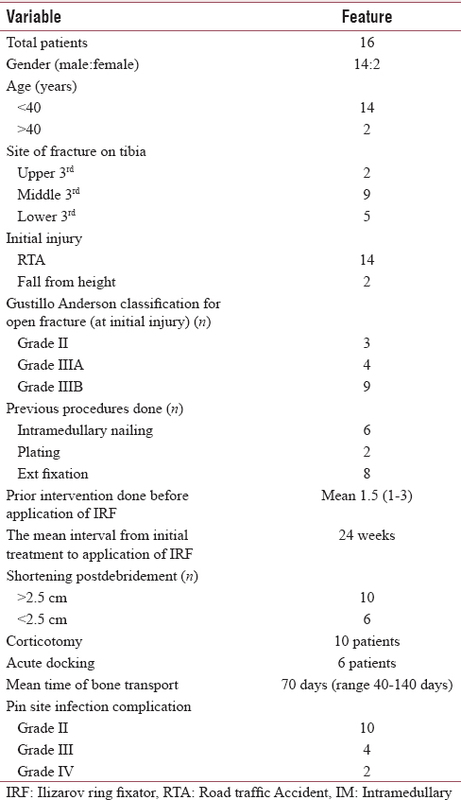 The time of bone transport took a mean of 70 days (range 40–140 days), and the mean time of IRF 3.5 months [Table 1]. According to ASAMI classification, bone results were excellent in 9, good in 5, fair in 2, and no poor More details listed [Table 2]. Functional results were excellent in 9, good in 5, fair in 2, and no poor. More details listed in [Table 3]. 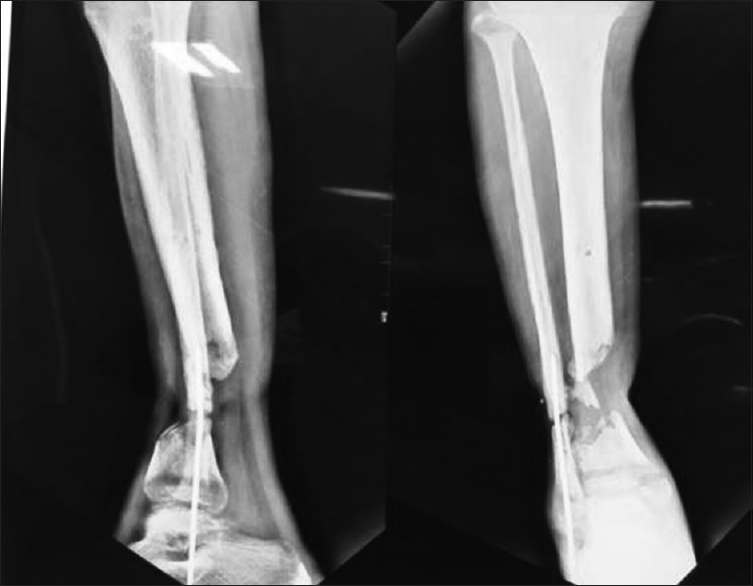 A case with infected nonunion lower third tibia with bone loss managed by Illizarvo ring fixator and Distraction osteogenesis as shown in [Figure 1], [Figure 2], [Figure 3], [Figure 4], [Figure 5], [Figure 6], [Figure 7], [Figure 8], [Figure 9], [Figure 10], [Figure 11], [Figure 12], [Figure 13]. The most common complication is pin site infection. Out of 16 patients, 10 had Grade II, 4 had Grade III, and 2 had Grade IV infection which was managed accordingly. All the patients had a feeling of pain during the distraction period and required oral analgesics. No patient had an axial deviation, four patients had some minor complication such as pin loosening, which was managed by minor realignment and removal old pin with reinsertion of new pins. There were no neurovascular complications or a compartment syndrome. Treatment Infected nonunions of tibia is difficult and requires meticulous planning and execution of complex, time-consuming surgeries. Ilizarov technique has been employed as a successful and dependable modality of treatment for infected nonunions of long bones.,, Jain and Sinhain their study of infected nonunions suggested that distraction histiogenesis is the preferred procedure in nonunions with active or quiescent infection and a bone gap of 4 cm or more. Struijs et al. noted that one-stage debridement and bone transport using Ilizarov frame resulted in union in 70% to 100%. In the present study, we achieved union in all cases and with no persistent infection. When we compare our results with other studies, Dendrinos et al. had in a study of 28 infected tibial nonunions 14 (50%) excellent, 8 (28.5%) good, 1 (3.5%) fair, and 5 (18%) poor results. Magadum et al. in a study of 25 infected tibial nonunions had 19 (76%) excellent, five (20%) good, and one (4%) poor while functional results excellent in 15 (60%), good in eight (32%), one fair (4%), and one poor (4%). These results were comparable to our results. The treatment of infected nonunion in elderly is even more challenging in view of reduced physiological reserve, presence of osteopenia/osteoporosis, reduced healing capabilities. Two out of 16 patients in our study were aged between 40 and 60 years. 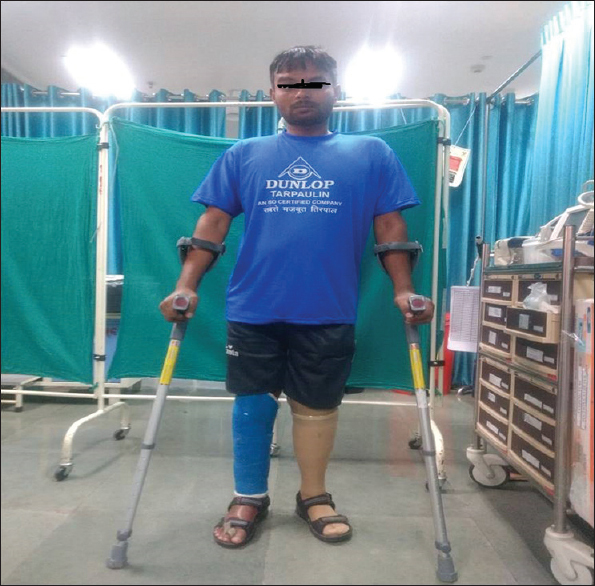 Older patients struggle to get satisfactory purchase with conventional fixators; however, we found no major problems with use of tensioned Ilizarov wires for fixation in them. All these patients tolerated the frame well and we did not notice any increased incidence of pin/wire loosening in this subset of patients. The capability to bear weight is an enormous benefit to the older population, where recumbency has a negative impact on the overall physiology and can escalate the risk of thromboembolic disease and infections. 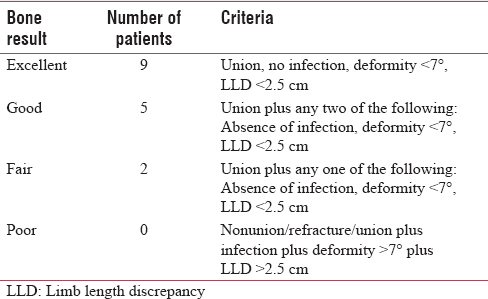 While treating infected nonunion of tibia, some important aspects of Ilizarov need to be paid attention are debridement should be performed radically to avoid the recurrence of infection. IRF should be assembled with strict adherence to principles, wires should be adequately tensioned. Start distraction usually after 7 days of corticotomy at the rate of 0.25 mm per 6 h. If regenerate quality is poor, the speed of distraction will slow down. 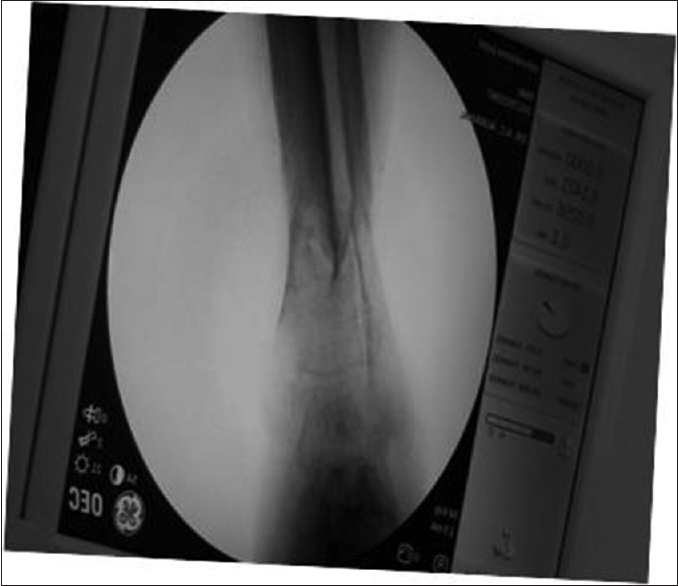 X-ray films should be reviewed at 2 weeks' interval during the distraction period and monthly during the consolidation period to supervise the regenerate quality, the axis of the traction on the segment, and the mineralization of the distracted area. Pateints were mobilized with support of crutches and encouraged to move adjacent joint. When the callus mineralization completes, patients should allow to bear full weight and remove the external fixator after 4–8 weeks and dynamization of IRF. In infected tibial nonunion with the help of radicle debridement, Ilizarov ring fixation and distraction osteogenesis satisfactory bony and functional results can be achieved. Our study and current literature also support the mentioned fact. However, our study lacks the direct comparison with other treatment modalities, the sample size of our study is small; hence, larger randomized control trial is required to generate more valuable conclusion. Ring D, Jupiter JB, Gan BS, Israeli R, Yaremchuk MJ. Infected nonunion of the tibia. Clin Orthop Relat Res 1999;369:302-11. Phieffer LS, Goulet JA. Delayed union of tibia (instructional course lecture). J Bone Joint Surg Am 2006;88-A:205-16. Rohilla R, Siwach K, Devgan A, Singh R, Wadhwani J, Ahmed N, et al. 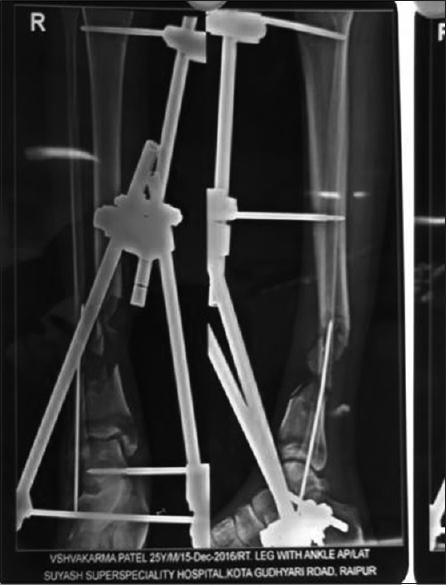 Outcome of distraction osteogenesis by ring fixator in infected, large bone defects of tibia. J Clin Orthop Trauma 2016;7:201-9. Dell PC, Sheppard JE. Vascularized bone grafts in the treatment of infected forearm nonunions. J Hand Surg Am 1984;9:653-8. Bumbasirević M, Tomić S, Lesić A, Milosević I, Atkinson HD. 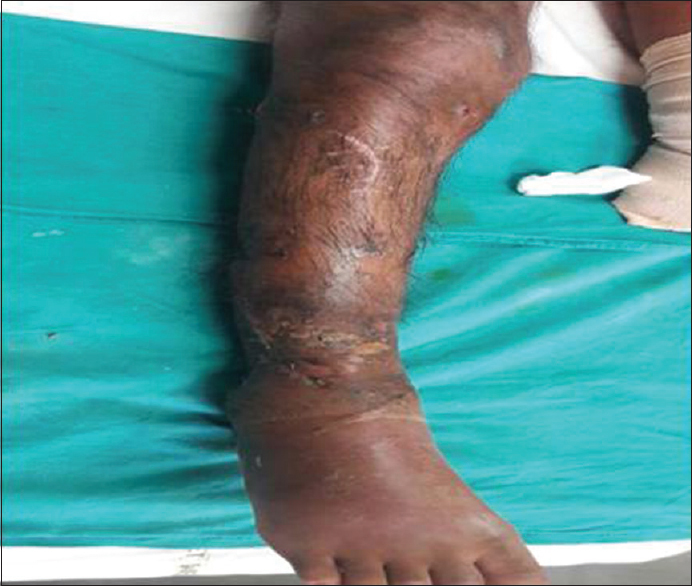 War-related infected tibial nonunion with bone and soft-tissue loss treated with bone transport using the ilizarov method. Arch Orthop Trauma Surg 2010;130:739-49. Chaddha M, Gulati D, Singh AP, Singh AP, Maini L. Management of massive posttraumatic bone defects in the lower limb with the ilizarov technique. Acta Orthop Belg 2010;76:811-20. 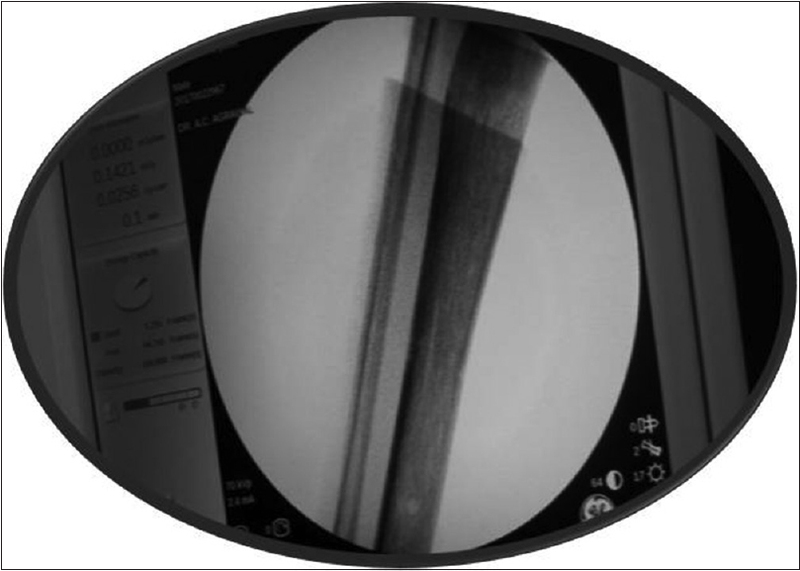 Patil S, Montgomery R. Management of complex tibial and femoral nonunion using the ilizarov technique, and its cost implications. J Bone Joint Surg Br 2006;88:928-32. Association for the Study and Application of the Methods of Ilizarov Group. Nonunion of the femur. In: Maiocchi AB, Aronson J, editors. Operative Principles of Ilizarov Fracture Treatment, Nonunion, Osteomyelitis, Lengthening, Deformity Corrections. Baltimore: Williams and Wilkins; 1991. p. 245-62. Cattaneo R, Catagni M, Johnson EE. The treatment of infected nonunions and segmental defects of the tibia by the methods of ilizarov. Clin Orthop Relat Res 1992;280:143-52. Golyakhovsky V, Frankel V. Operative Manual of Ilizarov Techniques. Saint Louis: Mosby-Yearbook, Inc.; 1993. p. 146-8. Catagni M. Imaging techniques: The radiographic classification of bone regenerate during distraction. In: Maiocchi AB, Aronson J, editors. Operative Principles of Ilizarov. London: Williams & Wilkins; 1991. p. 53-7. Jain AK, Sinha S. Infected nonunion of the long bones. Clin Orthop Relat Res 2005;431:57-65. Dendrinos GK, Kontos S, Lyritsis E. Use of the ilizarov technique for treatment of non-union of the tibia associated with infection. J Bone Joint Surg Am 1995;77:835-46. Magadum MP, Basavaraj Yadav CM, Phaneesha MS, Ramesh LJ. 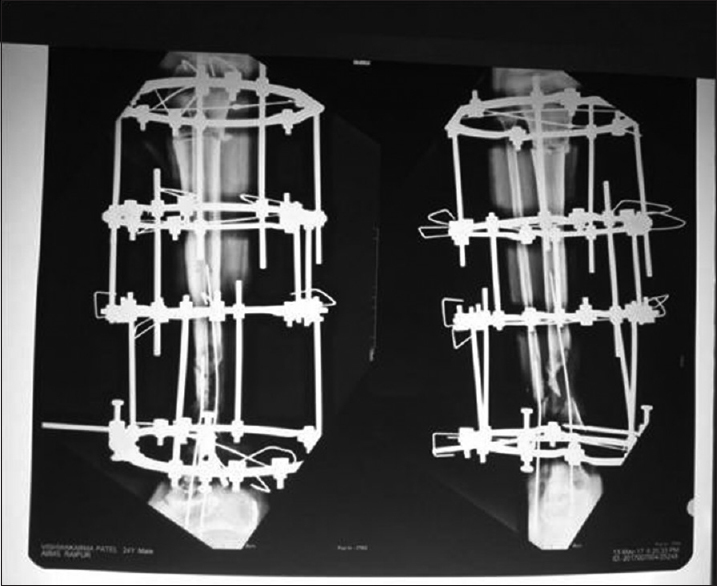 Acute compression and lengthening by the ilizarov technique for infected nonunion of the tibia with large bone defects. J Orthop Surg (Hong Kong) 2006;14:273-9. Kelsey JL, Keegan TH, Prill MM, Quesenberry CP Jr., Sidney S. Risk factors for fracture of the shafts of the tibia and fibula in older individuals. Osteoporos Int 2006;17:143-9.